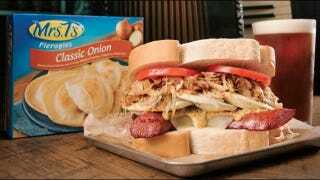 In addition to being piled high with Mrs. T’s Pierogies, [Primanti’s “Polish Hill”] sandwich will include kielbasa, provolone cheese, hot grilled slaw, beer mustard and tomato between two slices of Italian bread. Not sure why they didn’t partner with a local place like Pierogies Plus or Cop Out. Mrs. T’s are kinda bleh, even as mass produced pierogies go.